Lake Country Flat Cutback DA Black Foam Finishing Pads are made exclusively for use on DA or Random Orbital machines. All pads have Velcro buffed back from edge to avoid hitting the buffing surface as well to help center on the backing plate. Constructed of unique urethane foam formulations which outperform and outlast standard foam buffing pads. Lake Country Flat Cutback DA Yellow Foam Cutting Pads are made exclusively for use on DA or Random Orbital machines. All pads have Velcro buffed back from edge to avoid hitting the buffing surface as well to help center on the backing plate. Lake Country Green Foam Flat Light Polishing Pads are used for medium polishing in smaller areas. Use this foam to apply one-step cleaner waxes. It is a balance of polishing and finishing that is perfect for all-in-one product application. Lake Country Orange Light Cutting Flat Foam Pads is firm, high density foam for scratch and defect removal. Use this pad with polishes and swirl removers. 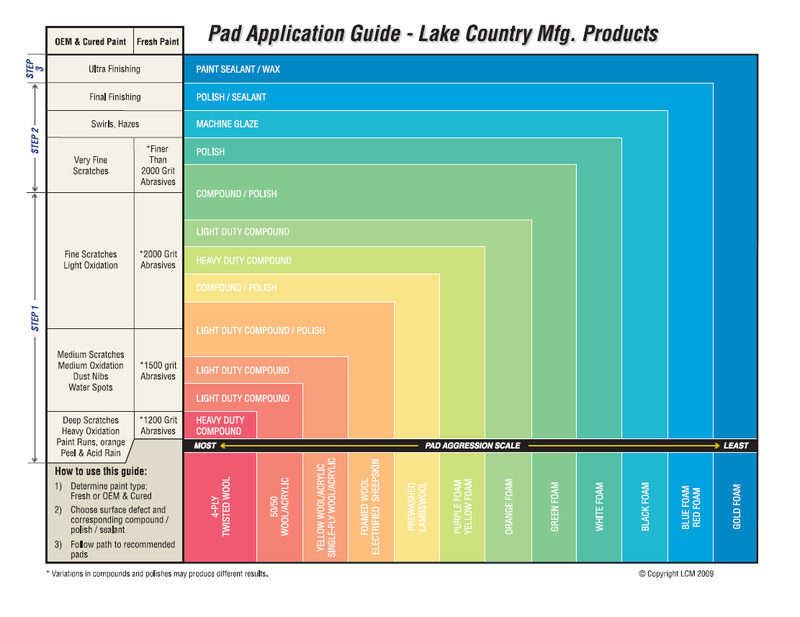 It’s an all around pad that will work on most light to moderate imperfections.